Discussion in 'Worldwide MMA Discussion' started by shonuf, May 12, 2014. King Mo by being the better fighter at this point. Brooks with the upset. Just for fun. Shlemenko by body shot. Tito is a ringer for body shots and doesn't have the gas at this point. Rainey by decision. I fully believe Page is hype in its purest form. Volkov by KO. Blagoi's best chance is on the ground and every where else I think he's outclassed. Tito is in for a beating against Alex. Not ready to vote yet but i kind of think Mo is going to pull this fight out. He may have lost to Newton but Rampage isn't throwing the way Newton does or moving like that. A little surprised to see people don't see Blagoi Ivanov as the favorite. 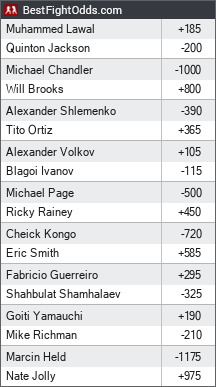 Ivanov vs. Volkov is the only fight in the poll where there's no huge favorite. Da Bombers is just trolling now. I believe he is. Sure Rampage has had his KO's but none of them were as completed of a fighter as King Mo is. I think Mo will frustrate Rampage and take home a dec.
Mo gonna gas after 1 round of trying to take it to the ground.